Streamlined, elegant, and filled with Roland’s latest high-end features, the premium-class DP90Se elevates the compact home piano to unmatched levels of luxury and expression. 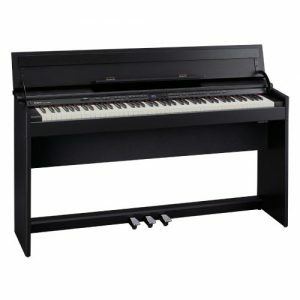 The acclaimed SuperNATURAL Piano sound engine has been enhanced with a Dynamic Harmonic feature for fortissimo playing, while the ultra-sensitive touch of the new PHA-4 Concert Keyboard with Escapement and Ebony/Ivory Feel allows you to harness SuperNATURAL Piano’s tonal variations and natural dynamics like never before. Powerful new Individual Note Voicing is included as well, which gives you the ability to customize every note of the piano to your taste. 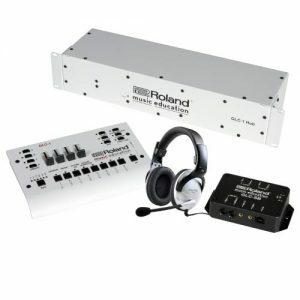 The unique Headphones 3D Ambience effect provides a rich, immersive sound field for private practice, and compatibility with Roland’s fun piano apps for Apple iOS devices will help motivate your interest in learning to play. With its superior features, space-saving design, and beautiful mirror-like finish, the DP90Se delivers a premium piano experience that’s perfect for modern lifestyles. The DP90Se brings you a rich and rewarding musical experience every time you sit down to play, thanks to Roland’s advanced SuperNATURAL Piano technology. Just like a fine acoustic grand, each note has its own character, and the tonal color changes seamlessly with your touch to accurately translate your emotions into sound. Tone decay is natural and organic as well, with the decaying sound not only decreasing in volume, but also gradually changing in color to a softer tone. 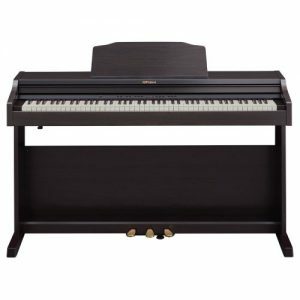 In addition to authentic grand piano tones, an upright piano tone is now included, which provides the unique short decay and up-close sound of a traditional upright instrument. As you refine your piano skills, your ability to play with a strong touch will improve, and the unique overtone characteristics created with fortissimo playing will provide a new palette of tonal colors for you to explore. The newly developed Dynamic Harmonic feature allows you to adjust these characteristics to your taste, offering a deep level of expressive control that will be welcomed by more experienced players as well. The DP90Se gives you an incredible amount of control to shape the piano’s sound for your personal playing style or a specific musical genre. 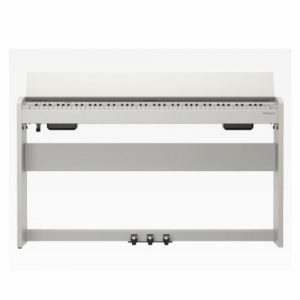 With the onboard Piano Designer, you can easily adjust overall tonal elements such as string resonance, soundboard behavior, and many others. For even more detailed customization, the newly added Individual Note Voicing feature lets you adjust the pitch, level, and tonal character independently for all 88 notes. In addition to personal tone shaping, this unique and powerful voicing option is also useful for balancing the overall piano sound to perfectly suit the acoustic properties of any room or the response of a particular set of headphones. Regardless of whether you’re a beginning student or an advanced player, the DP90Se’s magnificent touch is sure to inspire new levels of passion and creativity in your piano performances. 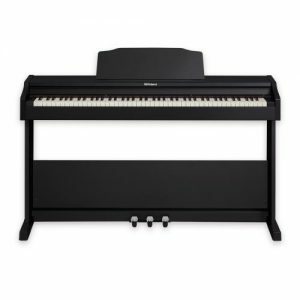 Roland’s flagship PHA-4 Concert Keyboard with Escapement and Ebony/Ivory Feel includes the latest touch-detection technology, allowing you to deeply explore SuperNATURAL Piano’s expansive tonal range. With fast key repetition and high-resolution sensing, the PHA-4 faithfully translates into sound the subtlest differences in tone from different playing styles and dynamics. 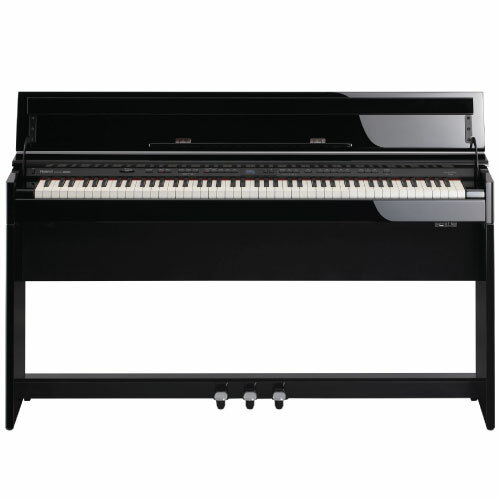 In addition, the keys are finished with specially developed materials that have moisture-absorbing properties, providing the natural texture and tactile sensation of real ivory and ebony keys on a fine acoustic grand. The PHA-4’s authentic hammer-action mechanism also produces less audible noise than previous designs, a welcome feature for not disturbing others when playing with the speakers muted during practice sessions with headphones. The DP90Se has been designed to produce a rich sound experience with its onboard audio system, which features large speakers built into the stand. But if you practice at night or when others are nearby, you’ll likely be listening to the instrument through headphones for long periods of time. With the newly developed Headphones 3D Ambience effect, you can now enjoy the unique sound field of an acoustic piano during these private sessions. This innovative technology greatly enriches the piano experience when playing with headphones, making it feel as though the sound is emanating from the instrument itself. One of the keys to making daily practice more efficient is by recording and listening back to your playing for self-evaluation and improvement. The DP90Se’s easy-to-use recorder lets you capture your performances as MIDI data onboard the piano or as audio data to optional USB flash memory. To share your audio performances with your family, friends, or teacher, simply connect the USB flash memory to your computer and transfer the files, and then upload them to your favorite sharing services or social media sites. 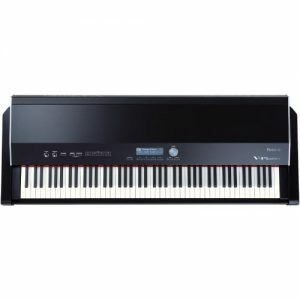 Having access to instant recording is a convenient feature not only for students, but for experienced pianists as well. Roland’s free apps for Apple iOS devices offer a unique and fun way to motivate your interest in playing and practice. With Air Performer, you can play along with favorite songs in the iPhone, iPad, or iPod touch wirelessly* through the DP90Se’s sound system. 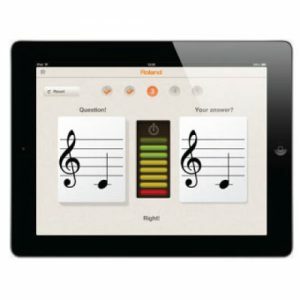 The Piano Partner app for iPad includes Flash Card, an interactive music program that kids will love, plus an intuitive graphical interface for exploring tones and songs in the DP90Se. Piano Partner also includes DigiScore Lite, which displays the DP90Se’s built-in songs as sheet music on your iPad. 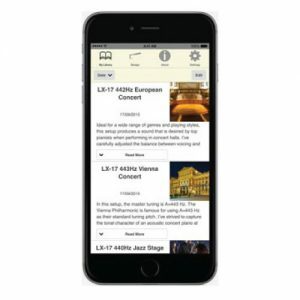 Available from the Apple App Store, these powerful apps make it easy to use today’s mobile technology to enhance your piano development. In addition to its authentic piano tone, expressive flagship keyboard action, and other premium features, the DP90Se impresses even further with a stylish, modern design that’s surprisingly compact. The integrated keyboard lid provides a flat, uncluttered surface when closed and a stately, upright piano-style music rest when opened. A special safety mechanism ensures that the lid always closes slowly, a great benefit for avoiding finger injuries when children are using the piano. With its striking mirror-like finish and streamlined form, the DP90Se brings an elegant piano presence to any home, including smaller spaces such as apartments and condos. 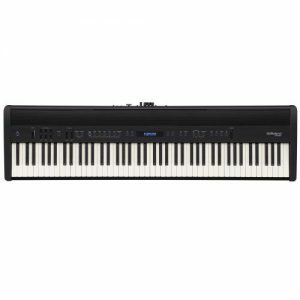 As a digital instrument, the DP90Se offers many advantages over acoustic pianos, including no need for tuning and other regular maintenance, plus onboard metronome and recording features, silent practice with headphones, USB, and many others. The DP90Se also includes some newly developed digital convenience features that offer further practical benefits for music practice. For example, the Volume Limit function lets you preset a maximum level for the piano’s volume control, a great way to prevent your kids from playing loud sounds unexpectedly. You can also adjust the desired headphones volume separately from the speaker volume, which helps prevent unintended loud sounds from being output through the headphones when they’re plugged in. 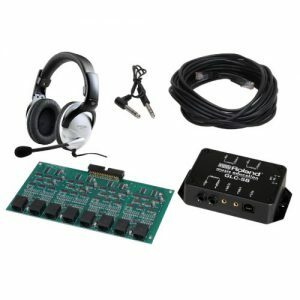 The DP90Se is equipped with both stereo 1/4-inch and stereo 1/8-inch miniature headphone jacks, allowing you to connect either standard over-ear headphones or the small earphones that are popular with music players and mobile devices.